Since we introduced it last week, people have created many thousands of Custom Search Engines (CSEs). We all have our personal favorites (mine is the Costume Search Engine--for the name alone), but it's hard to keep track of urls like http://www.google.com/coop/cse?cx=005946352831473999820%3Aqdkicbyttxy. It's also tough to help users find and return to the search engine you painstakingly created. So now there are two new gadgets that make Custom Search Engines more easily accessible for your users and yourself. The first gadget is for fans of your search engine. Help them access it from everywhere -- their Google personalized homepage, their desktops, or from wherever Google Gadgets are syndicated. This gadget is a small and simple search box for your CSE that we hope keeps users coming back to your site. To help your users find your CSE gadget, add the button to your site. You can add it more than once, and it probably makes sense to have one next to your search engine's search box. There are instructions for adding this button in the "Code" tab of your search engine's control panel. Once a user clicks the button, they will have easy access to your CSE, and to your site if that's where you display the search results. If you want see how the button works before putting one on your site, visit your CSE homepage on the Google Co-op site. The second gadget helps you access and manage your own CSEs. We're calling it the Custom Search Console. You can add it now to your Google personalized homepage, or look for the button at the bottom of your CSE management page. The console provides an instantly-updated view of all your CSEs, complete with with links to their homepages, control panels, and a dedicated search box all crammed into a tiny-but-usable interface. 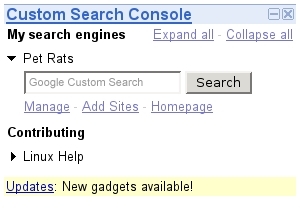 This screenshot shows my Custom Search Console, including the Pet Rats Custom Search Engine I recently started building.